Results from the July 28 DCI Southeastern Championship in Atlanta determine the performance order for each night of the DCI Eastern Classic. Once seeded in score order within their respective events, corps were drawn at random in groups of three (First through third, fourth through sixth, etc.) to determine the performance order. 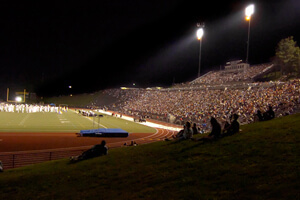 DCI Eastern Classic J. Birney Crum Stadium Linden St. & 20th St. Allentown, PA 18105 Friday, August 3 5:00 PM - Gates Open 6:47 PM - Pioneer 7:04 PM - Mandarins 7:21 PM - Pacific Crest 7:38 PM - Colts 7:55 PM - Troopers 8:12 PM - Intermission - 17 min. 8:29 PM - Spirit of Atlanta 8:46 PM - Phantom Regiment 9:03 PM - Bluecoats 9:20 PM - Carolina Crown 9:37 PM - Blue Devils 10:00 PM - Awards Ceremony Buy tickets to this event. Saturday, August 4 5:00 PM - Gates Open 6:30 PM - Cadets 2 (Exhibition) 6:47 PM - Cascades 7:04 PM - Jersey Surf 7:21 PM - The Academy 7:38 PM - Crossmen 7:55 PM - Glassmen 8:12 PM - Blue Knights 8:29 PM - Blue Stars 8:46 PM - Intermission - 17 min. 9:03 PM - Madison Scouts 9:20 PM - The Cavaliers 9:37 PM - Boston Crusaders 9:54 PM - Santa Clara Vanguard 10:11 PM - The Cadets 10:28 PM - Bridgemen Alumni Buy tickets to this event. Eastern time zone. All times approximate and subject to change.